999: that was the reading in air pollution monitoring stations in New Delhi on 15 June. Adding to the city’susual vehicular emission pollution was a sand storm blowing in from the Thar Desert (see picture below). Usually, even on bad air days, the Indian capital’s Air Quality Index (AQI) is usually less than 160 – so last weekend was literally off the charts. The dust was blown over by westerly winds into Nepal, where residents of Kathmandu saw trees, plants, parked cars and houses all covered in the muddy rain that fell for three days over the weekend. This was proof that trans-boundary air pollution from India is a serious concern for Nepal. 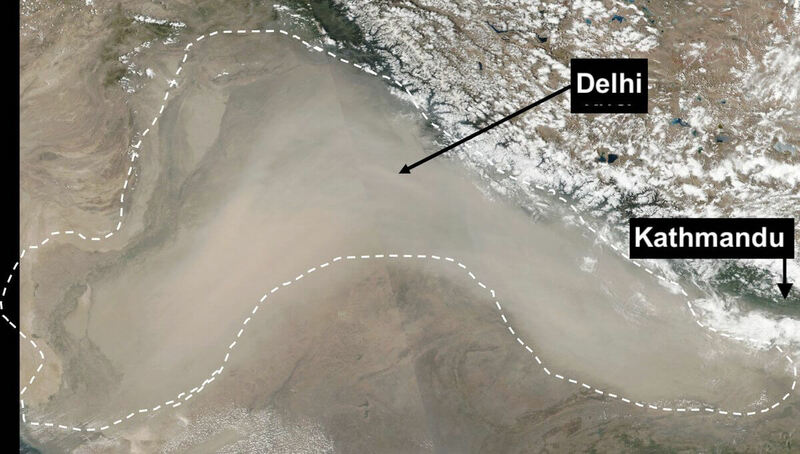 Fortunately the dust particles are bigger and are relatively less harmful than the more toxic smog also blanketing the north Indian plains that also gets blown over. Atmospheric scientists say more than a third of the pollution in Nepal in winter is blown in from across the border. The rest is local dust, vehicular exhaust, soot particles from brick kilns and open garbage burning in Nepal itself. Air pollution is the reason for 250 out of every 100,000 deaths in Nepal. Data this winter showed that Nepal’s mountain cities and the Tarai had some of the worst air quality in the world – sometimes dirtier than Beijing and Delhi. On 23 April this year, the AQI for Kathmandu was nearly double that in Beijing (153) and New Delhi (167) measured at that the same time. Christa Hasenkopf, atmosphere scientist and co-founder of OpenAQ, world’s first real time air pollution data platform, was in Nepal this week for a series of workshops on ensuring that air pollution measurements has an impact on policy formulation and decision-making by raising public awareness and sensitising government officials. Hasenkopf had previously worked in Ulaanbaatar, Mongolia, which also has high levels of pollution, and says making real-time pollution data available to the public can move governments to act. For the past two winters Kathmandu has been blanketed by dust raised by post- earthquake reconstruction, endless road widening and pipe-laying work for the Melamchi project. This added to vehicular pollution, smog from the Indian plains that also included heavy smoke from crop residue burning this year. Kathmandu was shrouded in a perpetual pall of dust and smoke. Hospitals reported record numbers of patients with respiratory illness including Chronic Obstructive Pulmonary Diseases, bronchitis, asthma, emphysema and lung cancer. Moreover, findings from a study conducted by the Energy Policy Institute at the University of Chicago last year showed that worsening air pollution is decreasing life expectancy of South Asians, and of Nepalis by up to four years. All this has provoked a public outcry, increased awareness about health implications of poor air, but the government has been slow to act. It just revoked a law banning vehicles more than 20 years old, and emission tests and green stickers can be easily bypassed. Even so, change is in the air since local governments were elected last year after 20 years. While public awareness has spurred private institution and the government to monitor air quality, battling pollution requires a long-term effort along with public engagement and political will, and Nepal lags far behind on the policy front, unlike neighbouring China that is switching to electric vehicles and green energy. “Nepal has limited access to air quality data. This gap in information is a major problem when advocating for policy change,”said Hasenkopf, adding that while access to open data and its dissemination to the community through media, academic papers on public health and social networking sites can have a huge impact, the next step is to ensure clean air at the policy level.